Congratulations to our Britt and Tony on their wedding a couple weeks ago! We worked with them on a variety of letterpress stationery for their San Francisco wedding, including these announcements and bookmarks. 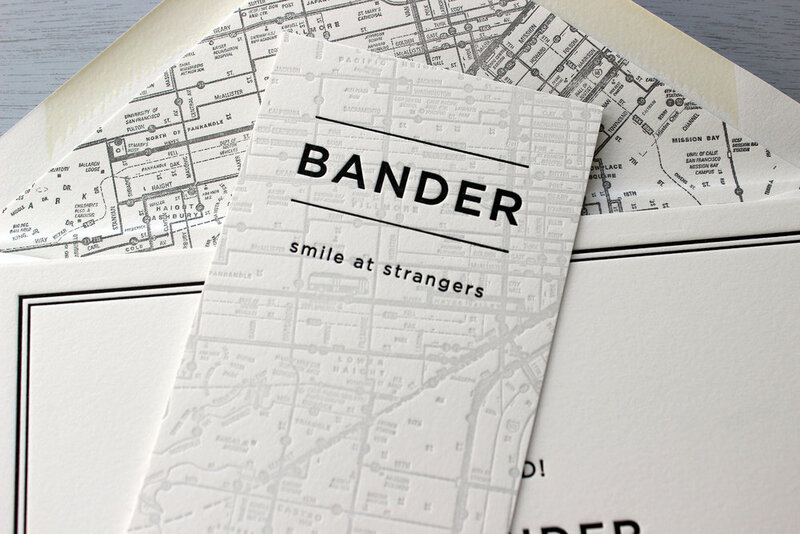 They have a really sweet story about meeting on a city bus, and wanted to incorporate that into the design of their stationery. The image of the bus became a fun recurring element, as well as the map of San Francisco's transit system. We love these big apple themed invitations we printed for a wedding here in New York City! This couple really embraced all things New York for their fall wedding. Different landmarks of NYC topped all of the cards in a letterpress printed tint. The subtle silhouettes of the Statue of Liberty, a taxi and the Brooklyn Bridge added a modern touch. We also designed a red belly band with a really cute monogram, featuring their initials in script and an apple silhouette in the middle. We love working with couples from New York on their wedding invitations. It's always fun to see where they'll be holding their event, since we're often familiar with the venues. These letterpress wedding invitations are for a Brooklyn couple, who wanted to keep their design simple and clean. 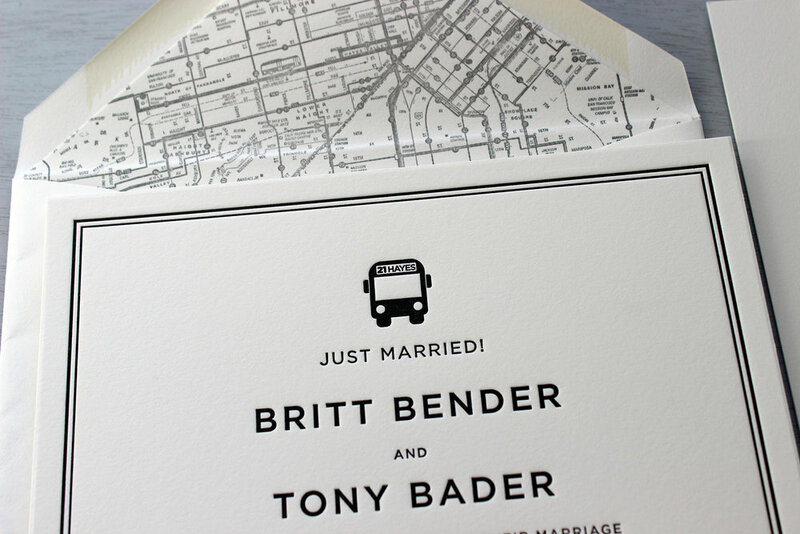 We added the subway car as a nod to their daily commute and a vintage new York map as an envelope liner. All the pieces were printed in a dark charcoal gray for a little twist on classic black. Emily and Julian are New York City residents, and held their wedding here this summer. 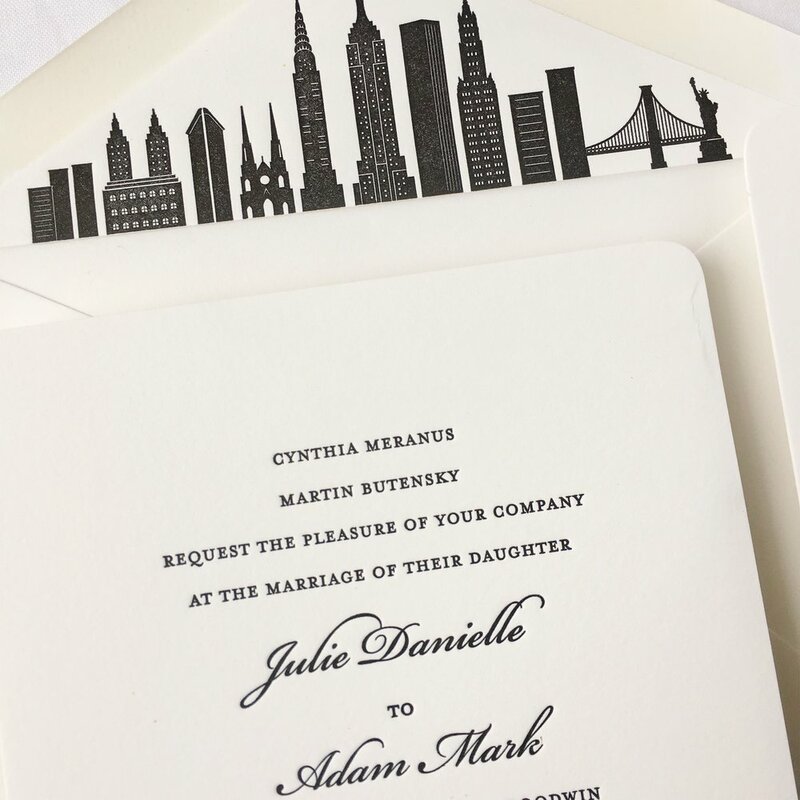 They wanted their wedding invitations to pay homage to one of New York's most iconic landmarks, the Chrysler Building. We kept the design simple and printed it in one color, a charcoal gray, for a classic look, just like the Chrysler Building. 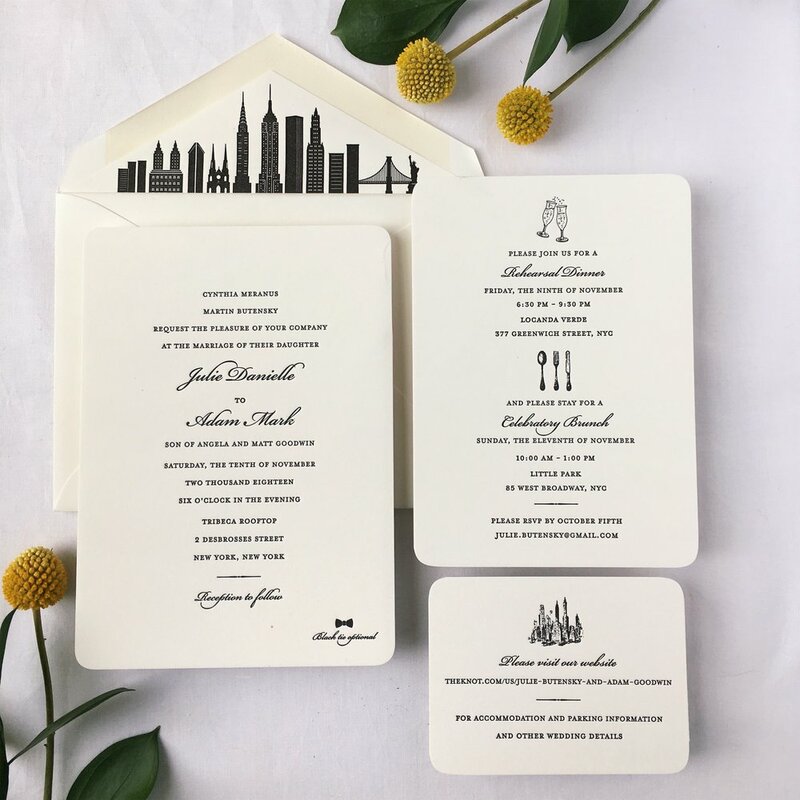 This art deco inspired skyscraper is truly a work of art, and looks just right on the top of this invitation. The gray letterpress printing shows off all the beautiful details of the building.